An 8-year-old boy was stripped of his T-shirt that bore the words ‘Super Dad’ during a visit to his father, under arrest for at least 14 months in Turkish government’s post-coup dragnet. 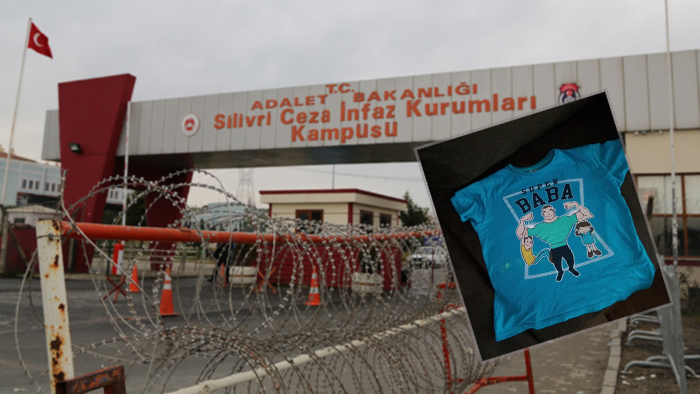 A recent tip submitted to Magdur Mesajları, a Twitter account known for solidarity postings for Turkey’s post-coup rights victims, has allegedly shown that prison guards removed a minor’s T-shirt simply because it had praising words for the boy’s father, who is not even convicted for the charges raised against him. “My sweetheart excitedly woke up at 6 in the morning, and put on himself the very same T-shirt he always wore before visiting his father. Following a long lineup during the security control at the prison’s gate, he passed me along with his elder brother. The control for women lasted longer. When I arrived in the meeting area, I saw his weeping eyes though I did everything for him not to cry over the past months,” his mother wrote to the Twitter account. While the mother shared no further specific details about the incident, her message read that her husband has been under arrest for 14 months. The frenzy over the words on T-shirts have emerged only recently when Gökhan Güçlü, one of the suspects on trial for an assassination attempt against President Recep Tayyip Erdoğan on the night of a coup attempt last year, was thrown out of the courtroom on July 13 for wearing a similar T-shirt. Any material bearing the word “hero” has become suspicious following a series of detentions across Turkey of people wearing T-shirts bearing similar words. At least 41 people have been detained for wearing hero T-shirts since summer. While Turkish Airlines (THY) stopped distribution of its “Heroes” kits to children on board its planes during overseas flights, Mustafa Kaya, the district director of national education in Izmir’s Seferihisar was taken into custody over his picture taken near a ‘hero’ graffiti on Friday.